It has been roughly 2 weeks since the event concluded and we’re just now catching our breath from the overwhelming success! The full weekend of science hacking was nothing short of inspirational awesomeness – provided by the approximately 100 science hackers who descended upon Institute For The Future for the first Science Hack Day SF. From sonifying particle collision data from accelerator labs to Android-powered spectrograph robots, a full spectrum of hardware and software hacks were created. Hacking began around lunch time on Saturday (after a great FooCamp-style 3-tag intro of everyone in attendance) and all hands were ordered to be off keyboards at 13:37 the following day. IFTF was a wonderful host that allowed everyone to continue hacking throughout the entire night. I heard the Science Walk project team (a hack for mashing up science education with geonotes) was outside doing GPS testing at 2am, and several people were hacking non-stop into the early daylight hours. The full list of demoed hacks is on the wiki. The demos of what people made in 24 hours were really fun and inspiring – a full range of different and non-traditional ways of solving problems, creating new ideas and communicating data. 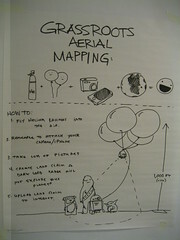 We also requested for each team to create an infographic (with optional artistic assistance from one of our attendees!) representing the “big idea” behind their hack – they’re quite delightful artifacts to browse through. Congratulations goes out to the prize winners who were reviewed across 5 categories (Best Design, Science Geek, Best Physical Hack, Best Use of Data, and People’s Choice) by our lovely panel of judges. Best Design went out to Fancy Pigeons, a prototype of a fun game aimed at teaching players about genetics. The Science Geek award went to Android Participatory Exploration, a hack combining a low-cost spectrograph with an Android-based robot. Best Physical Hack went to Grassroots Aerial Mapping, a project that explored the outdoors by strapping a camera to high-altitude balloons to create unique, stitched-together aerial maps. Winning both the Best Use of Data and People’s Choice award was Particle Wind Chime, a hack that took particle collision data from accelerator laboratories and mapped it across various sounds. This made for a particularly cool aural experience that could someday be used as a diagnostic tool for scientists; it additionally inspired a late night meta hack for visualizing the sounds. 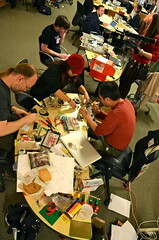 A big thanks to our prize donors: MakerBot, Dr. Kiki, MAKE, SFMOMA, California Academy of Sciences, TechShop and NASA! The diversity of hacks across different mediums and scientific subject areas were no doubt influenced by the diverse group of science hackers that attended. Based on our sign-up data, the rough breakdown of attendees was 33% female/66% male, with 33% developers, 20% scientists, 20% designers, and the remaining 27% were an awesome mashup of everything from robotic engineers to community managers and beyond (note: this data does *not* account for people with hybrid skills). The event concluded with Chris Gerty from NASA and Lindsay Eyink from Apple rounding most of us up to run outside and watch the International Space Station fly over us. It definitely felt like the proper way to end such a momentous weekend. A list of coverage around Science Hack Day is being kept at the bottom of the wiki. The event was covered by the BBC’s Science In Action radio show (starting at 20:57) and there was a great write-up on the Yahoo! Developer Network blog yesterday. 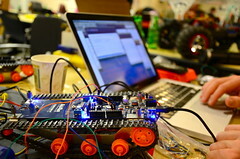 You can also check out all the photos by searching for the scihack tag on Flickr. Dr. Kiki and Erik Lanigan took an *extensive* amount of video at Science Hack Day SF that they are aiming to slowly release over the coming weeks/months – so keep an eye out for updates from @sciencehackday on Twitter! Last and most importantly, I have a TON of thank you’s to give! – Thank you to our sponsors: Institute For The Future, Amazon Web Services, Hot Studio, Yahoo! Developer Network, swissnex san francisco, TechShop, Mendeley, and Pasta Q. You helped make this amazing weekend happen without a hitch! All science hackers were well fed, sheltered, tool-equipped and full of inspiration thanks to you! – A huge heartfelt thank you to my co-organizing team: Arfon Smith, Amber Case, Ben Ward, David Harris, Ed Gutman, Eri Gentry, Ian Fung, Jeremy Keith, Jessy Cowan-Sharp, Kirsten “Dr. Kiki” Sanford, Kishore Hari, Mathias Crawford, Matt Hancher, Matt Wood and Tantek Çelik. Together, we spent 4 months organizing Science Hack Day SF – each person bringing a unique perspective and experience to the table. These people are utterly awesome and I’m already missing having our Sunday organizing meetings that most of us came in person or Skyped-in for! – And of course, a massive thank you to each and every one of you who attended Science Hack Day SF! Each of you made the event the resourceful, fun and comfortable environment that it was by hacking, helping others, coming up with ideas, offering to help clean, giving talks, making friends, and learning about new things!